As you would expect, the carpets are spotless. The upstairs room at the Sydney Theatre where Sir James Dyson is officially unveiling his company's latest innovations - updated Airblade hand dryers and an Airblade Tap that also dries your hands - has impeccably clean carpets. Yet the cordless Dyson vacuum cleaner is only a prop; something Sir James reaches for during the interview to demonstrate what can be accomplished with the company's most recent innovations in digital motor technology. A technology that forms the backbone of every product in the Dyson catalogue. In fact, Dyson's developments in digital motors can be seen as one of his greatest accomplishments. While other companies have small motors capable of delivering something in the order of 35,000 rpm, the motor in the latest Airblade products can push out 110,000 rpm. By comparison, a jet engine rotates at around 15,000 rpm, while the motor inside a Ferrari spins faster at roughly 19,000 rpm. As Sir James explains: "No one else makes a motor that goes any faster than about 35,000 rpm, so these really are extraordinary motors. This one has neo-dynimium rare earth magnets in the centre inside a carbon fibre sleeve, and it runs between these copper wires which create an electrical field. On top of speed, Dyson has also made the motor smaller by using software to closely monitor and control its performance. 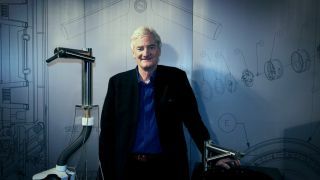 Soft-spoken and impeccably dressed, Sir James Dyson may look like a billionaire CEO, but he talks like the passionate, energetic engineer he is. He alternates between sitting back, relaxed, as we ask questions about the motors in his products, to energetically leaning forward to explain the technological advancements made since the last generation of motors. But it's not just motors that excites the 65-year old. Sir James is a passionate innovator, sponsoring design awards around the world to try and foster a focus on helping designers invent products with real world applications. Yet while winners have included some clever creations that solve real world problems, like the Airdrop, which pulls moisture from the air in arid locations by cooling it in underground pipes and using it to water plants, Dyson himself has no plans to take these ideas and turn them into Dyson products. "We want to let these inventors try their hands at becoming entrepreneurs as well," he explains, while pointing out that some of the winning designs from previous competitions are in early stages of becoming real world products. For all the advancements in motor technology that Dyson has accomplished, it's a shame that the technology can't be scaled up - there's no chance of seeing a Dyson electric car any time soon. That said, there's still potential for parts of the Dyson motor to scale, and Dyson itself is working out how to use the new, improved motor in updates to its current range of products, as well as potential new devices. But that doesn't mean the company is done developing its motors. When suggesting that at some point motors will reach a point where they can no longer be upgraded significantly and Dyson may need to look to other technologies to keep advancing, Sir James shakes his head like we'd just offered him a plate of raw chicken. "Oh no, we'll never be satisfied. We're always looking for ways to make them better," he says emphatically.